What is the FIXED Function? The FIXED Function is categorized under TEXT functionsFunctionsList of the most important Excel functions for financial analysts. This cheat sheet covers 100s of functions that are critical to know as an Excel analyst. It will provide a text representation of a number rounded to the specified number of decimal places. While doing financial analysisFinancial Analyst Job DescriptionSee a real Financial Analyst Job Description including all the skills, experience, and education required to be the successful candidate for the job. Perform financial forecasting, reporting, and operational metrics tracking, analyze financial data, create financial models, we often import data from external sources. Th FIXED function helps convert numbers into text. Number (required argument) – It is the number that we wish to round off and convert into a text string. If [decimals] argument is negative, the supplied number is rounded up to the left of the decimal point. FALSE – Commas are included in the resulting text. If the [no_commas] argument is omitted, it uses the default value of FALSE. 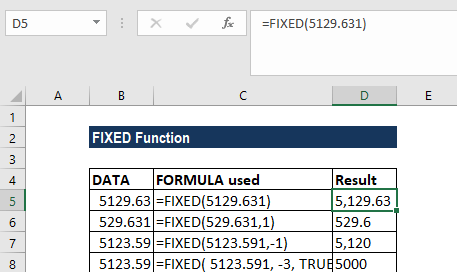 How to use the FIXED Function in Excel? #VALUE! error – Occurs when any of the supplied arguments are non-numeric. Remember that, once a number’s been converted using the FIXED function, it is stored in Excel as text. Therefore, it cannot be used in numeric calculations. Numbers in Excel can never include more than 15 significant digits, but decimals can be as large as 127.